This post was brought to you by the makers of Sutter Home. I received compensation to write this post through the Sweet on Spice program. 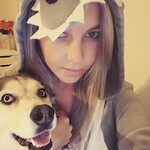 All opinions expressed are my own. 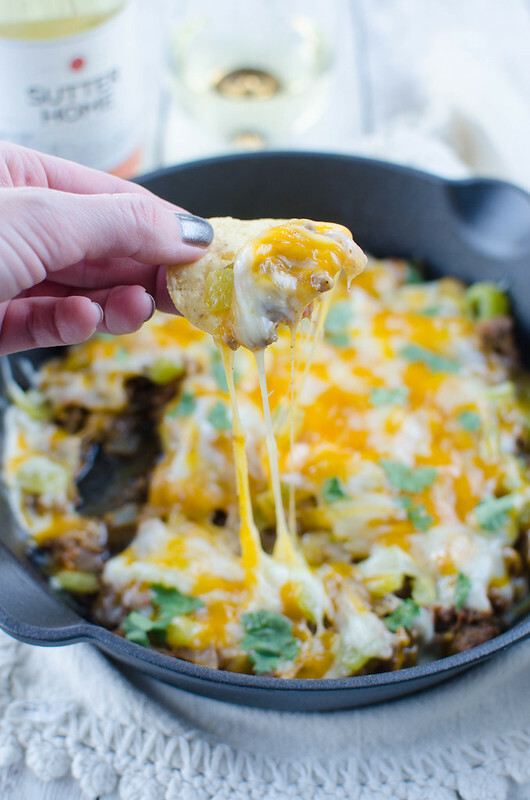 Hatch Chile Cheese Dip – roasted hatch chiles, spicy sausage, tomatoes, and 2 kinds of cheese! Serve with tortilla chips for the perfect football food! Okay, we’re a couple weeks into football season – how’s your team doing? More importantly, what have you been cooking for all the games?! My favorite combination right now for football food is sweet and spicy. I mean, a spicy cheesy dip with a sweet wine? 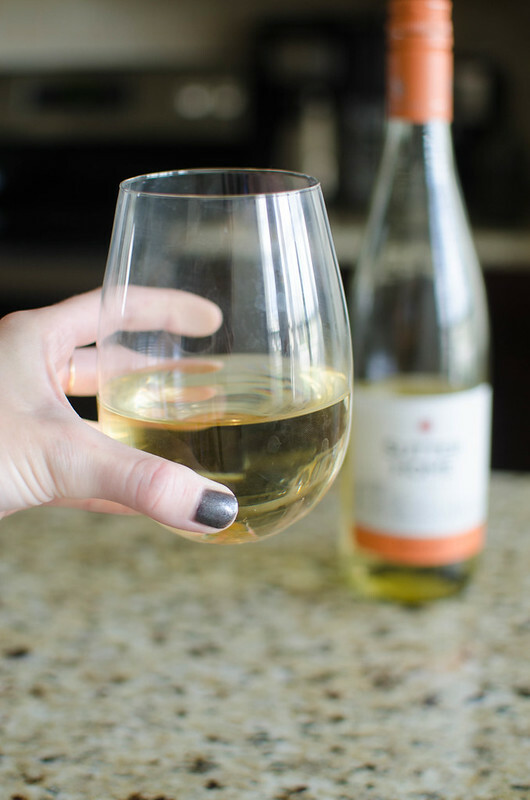 Sutter Home’s Moscato is the perfect sweet wine to balance all your spicy snacks. It offers a delicious bouquet of rose, lychee fruit and peach. Sutter Home is the second largest independent, family-run winery in the United States and offers more than 20 different varietals. And all at an affordable price! I wanted something spicy to pair with the sweet Sutter Home Moscato and, you guys, it happens to be my favorite time of year in Texas. Okay yes, technically, hatch chiles come from New Mexico but this time of year in Texas, you can get hatch chiles in any form you want. Fresh, roasted, in guacamole, baked into tortilla chips, on a rotisserie chicken, in a chocolate bar. The grocery stores come up with everything. I bought 3 packs of hatch chile sandwich cookies the other day and they went straight into my sweater drawer because these are the one cookie that I won’t share. The easiest way to prep hatch chiles is to pop them under the broiler for about 5 minutes per side and then put them in a container with a pretty tight lid. They steam themselves and the skin slides right off. From there, remove the ribs and seeds and then dice them up. I roast a ton of hatch chiles this time of year and then freeze the diced chiles so I have them all year. I run out by February every single year but, hey, who can resist throwing hatch chiles into everything they make? They’re added to a spicy sausage and tomato mixture and topped with a ton of cheese. That’s all baked until the cheese is melted and bubbly and then you serve it with tortilla chips. 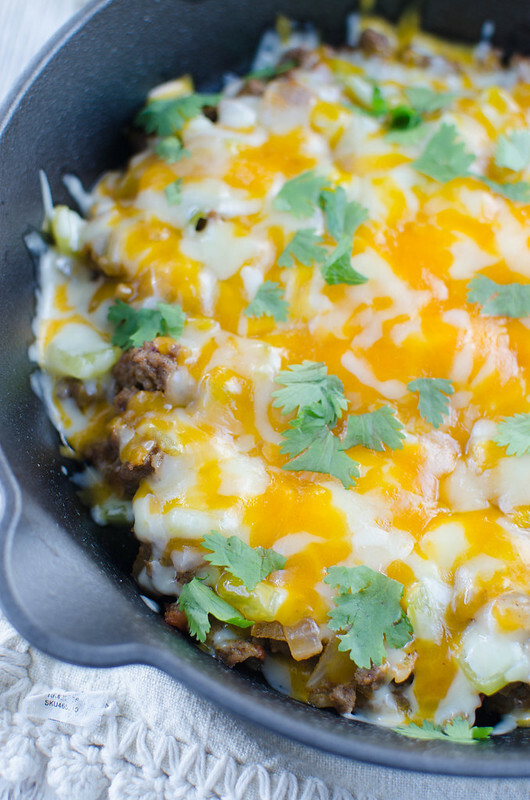 All of it (aside from the roasting of the peppers) is done in one skillet and then you can just serve it in the same pan which makes things super easy. Serve it with a glass of chilled Sutter Homes Moscato for the perfect Sweet on Spice pairing! 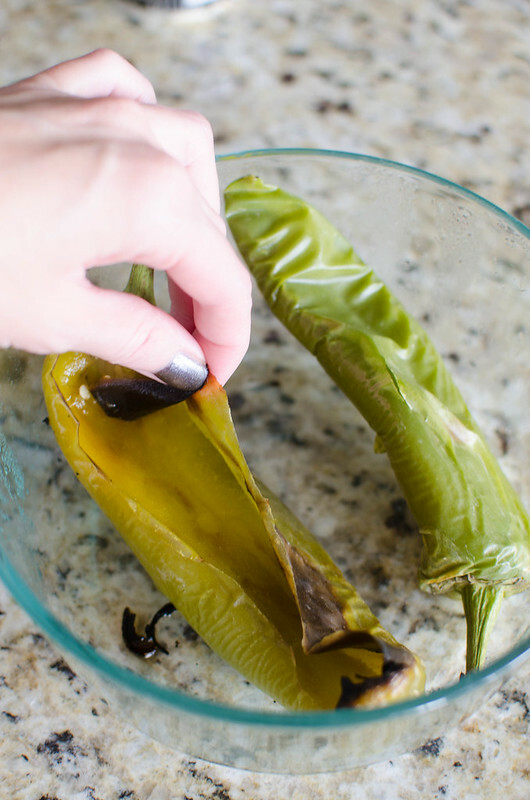 If you’re as obsessed with hatch chiles as I am, I’ve got a stuffed hatch chile recipe that you’ll love. 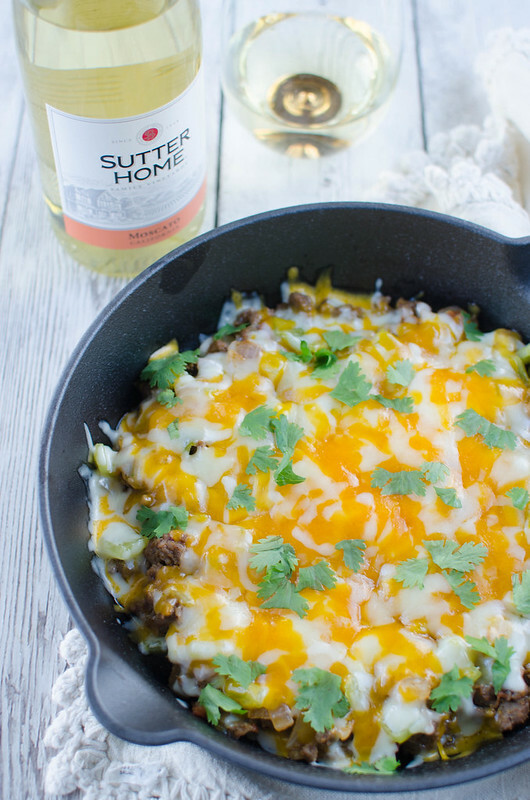 And if you just want something cheesy and spicy, my queso fundido that will go perfectly with Sutter Home’s Moscato. Be sure to check out Sutter Home to see all the different varietals they offer, as well as recipes and ideas! Preheat broiler. Broil chiles for about 5 minutes on each side, or until charred. Once charred, transfer to a dish with a lid and let sit for 15 minutes. Remove skin, ribs, and seeds. Dice chiles and set aside. Heat olive oil over medium heat in a 10-inch cast iron skillet. Add onion and cook for 2 minutes, until slightly softened. Add garlic and cook until fragrant, just 30 seconds. Add sausage and cook, breaking up as it cooks. 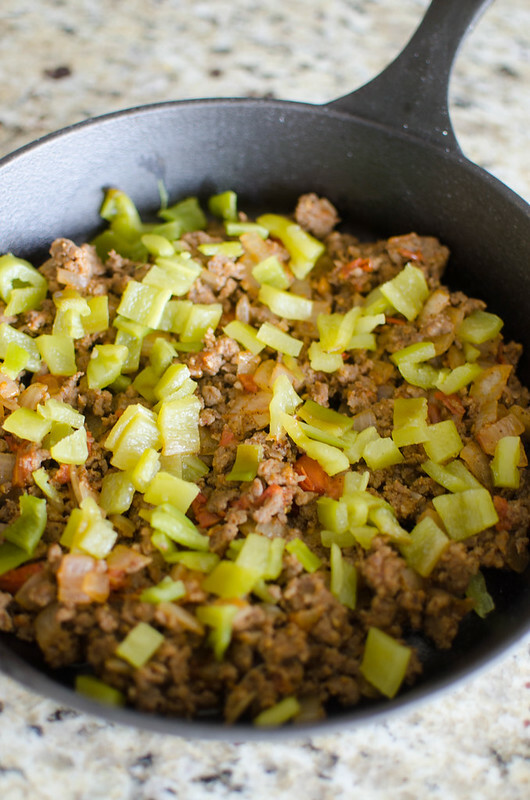 Once cooked through, drain off excess fat and add in diced tomatoes. Cook until most of the liquid has been absorbed. 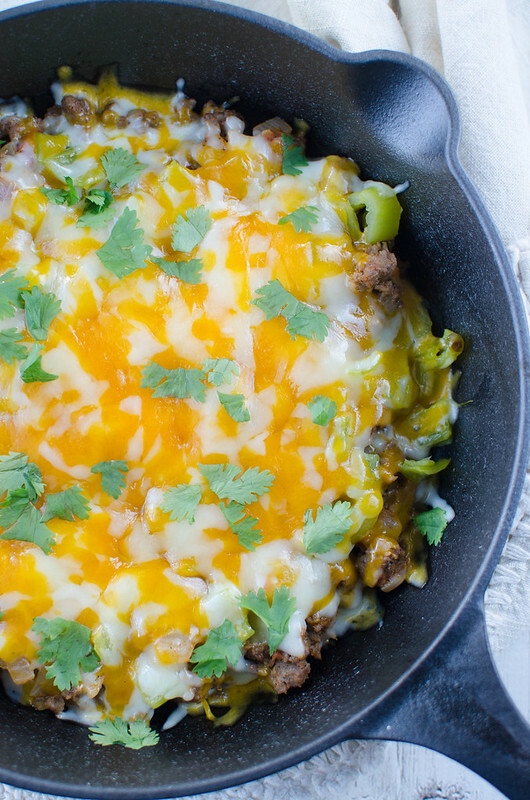 Remove from heat and sprinkle green chiles on top of sausage mixture and top with both cheeses. Bake until cheese is melted and bubbly, about 15 minutes. 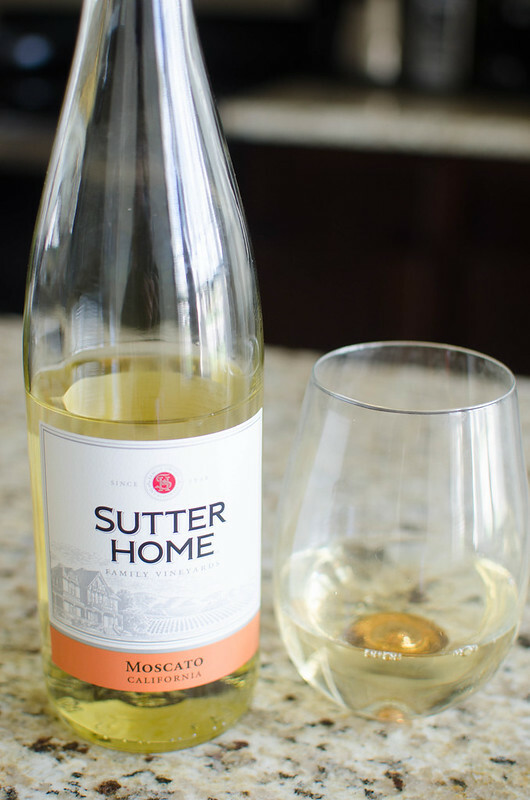 Serve immediately with tortilla chips and a chilled sweet wine like Sutter Home’s Moscato. 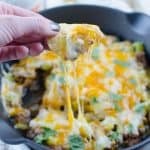 One Response to "Hatch Chile Cheese Dip"
I love cheesy meals! I think this would go great on a burger or even a burrito, i think it’d add some extra flavor to any dish. Great recipe!